Every time when a team comes to Nicaragua, they usually have a lot of questions and wonderings along the way here. They cannot stop questioning about: What are we going to do? Where are we staying? What is the food going to be like? What are we going to learn?…Together with unending questions and answers, they usually come here with different forms of expectations. For the past two weeks from the 10th to 19th of January 2015, we hosted a team from Michigan, the United States. Four different churches from tri-cities in West Michigan decided to come here as one team – Spring Lake CRC, Ferrysburg Community Church, First CRC and Second CRC in Grand Haven. Although they are from a small area, they didn’t know each other. However, throughout this trip and along with several rounds of ‘Dutch Bingo’, we had no conflicts of getting along. We built stronger relationships with one another as we were building new relationships with Nicaragüenses. We visited three main organizations: the Nehemiah Center, Tesoros de Dios (God’s Treasure), and the Luke Society. Each organization prepared small projects for us to complete. We joined the morning devotions at the Nehemiah Center and learned about the Center through Steve Holtrop. We repainted two offices and one meeting room in the Nehemiah Center. Some men in our group also helped build a closet for the Nehemiah Center. While some of us were working at the Nehemiah Center, four members of our team had an opportunity to visit Compassion International to meet a young boy, Joseph Israel Lopez Shiffman, because Jean Groenendyk, one of the team members, has been supporting Joseph since when he was 6 years old. It was definitely a special day for Jean, who finally had the opportunity to meet Joseph and his family. The face to face meeting was really meaningful to her and other three. 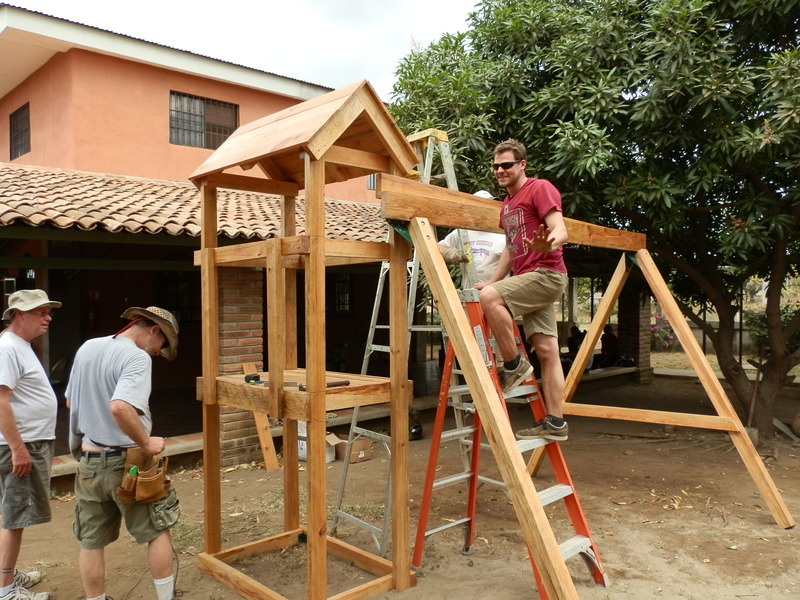 above photo: Building a playground at Tesoros. 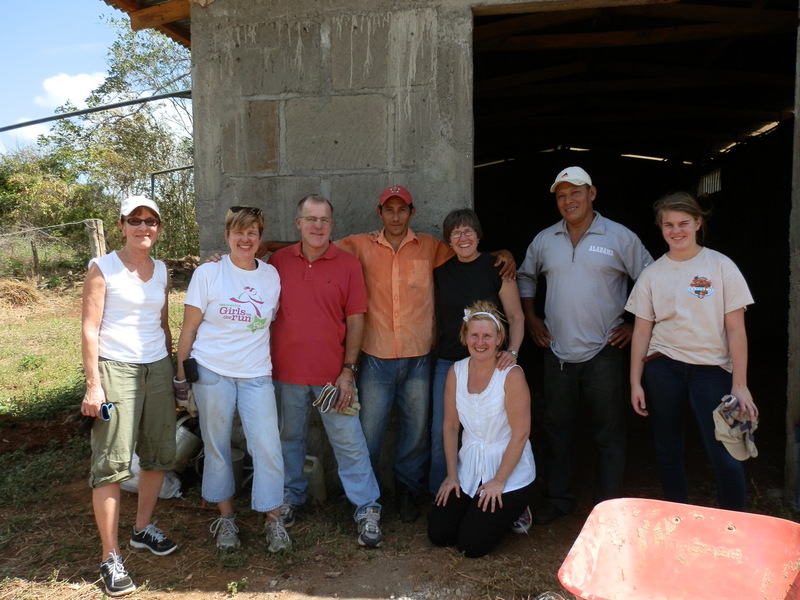 We also had a day trip to Jinotepe to visit the Luke Society and its partner community called El Manantial. When we visited the Luke Society’s Center, we had an opportunity to interact with other volunteers who are working for Luke Society and its partner communities in Nicaragua. Together with Alma Hernandez’s translation, we were able to learn about the Luke Society’s presence in El Manantial and their land bank project. We then traveled to the rural community, which took us around an hour to get to due to the many rutted roads. Since the community is so far out, people do not have access to electricity (only some have access to the solar panels) and as such they cook over fires and go to bed when the sun goes down. However, we heard from their testimonies how much those people were content with their lives as they had their own land to work with, something, they previously hadn’t considered a possibility. above photo: Bodega project members at El Manantial. We were divided into three groups to work on different projects: scoring walls in the new experimental center, removing 6-8 inches of hard clay from a bodega (warehouse), and digging a trench for water system. Besides physical work, we had an opportunity to communicate with farmers and listen to their inspiring stories of ‘before & after life’ of being part of the land bank project. Rich Hamstra said, “Faith is living with evidence and living with uncertainty. This trip was like that.” Without a doubt, we definitely evidenced divine providence through people in Nicaragua. The team found this trip as a life changing experience. The entire trip redefined what it means to be blessed. Journey of faith is unending. This trip became part of our faith journey where we took another one step closer to God. Now it is time for us to share it with our friends and families! Please pray for my work here. Asking God to give me a stronger passion towards people that I serve. I may not be able to do a grand work for them, but hopefully, my little help and work contribution could cause a little change. Please pray for our World Renew staff and CRWM staff in the Nehemiah Center. As we entered a new year, we have been implementing new (and better) system for logisitics and communication part. Please pray that this new system will allow us to work more strategically and efficiently.